Yes the name sounds dirty but it actually serves a cool purchase. Most iOS loop sequencers are a little lackluster, leaving you with too many restrictions and less than ideal sounds. Franke Music is founded by former Waldorf software developer Wolfram Franke and seems very appealing. Not only can you program drum loops but you can program your own sounds with your choice of a lot of effects and features. As implied by name, Stroke Machine lets users program their own rhythm and groove patterns and switch between them at a stroke in a live performance, mute or solo individual instruments, change parameters on the fly, and record performances as high-quality audio files for sharing or subsequent editing on a computer. Stroke Machine immediately stands out from the crowd. Its attractive and highly-functional high-contrast user interface is specifically suited to overcoming far from ideal lighting conditions that are typically associated with onstage operation, and also assists with making studio- based sound creation easier on the eye, too. 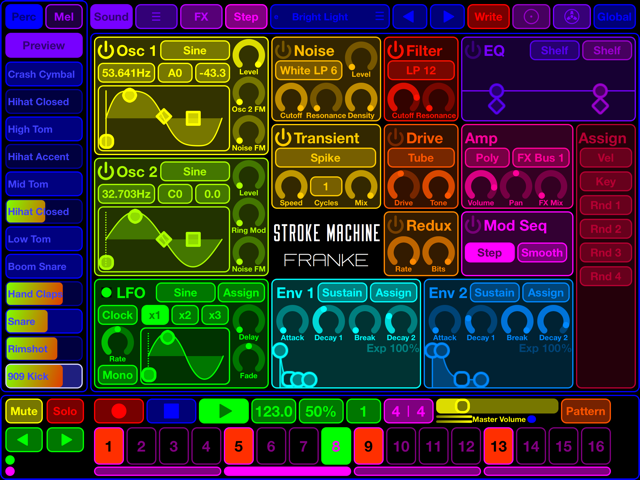 Similarly, Stroke Machine’s powerful synthesizer engine is dressed to impress. It features high-quality oscillator, filter, overdrive, and effect models; extremely fast envelopes and LFO; a sample-exact pattern sequencer; and a sophisticated sample, sound, and pattern library that are all equally ear-opening. In-depth sound creation possibilities come courtesy of Osc 1 and Osc 2 — both boasting typical analogue waveforms and sample playback; frequency and ring modulation; and a separate white and pink Noise generator with integrated multimode filter. All tone generators are summed into a Transient generator, followed by another multimode Filter and a Drive module (with several types), a sample rate converter and bit depth reduction stage (Redux), and a two-band EQ with shelf and bell curves. Freely-assignable modulations with an easy-to-understand interface (Assign) offer maximum flexibility, easily surpassing even expensive hardware synthesizers! Each sound is mixed into one of four FX busses — each featuring a sum overdrive (Drive), a compressor, a modulation effect (such as chorus, flanger, phaser, or sum filter), and a space effect (such as delay or clocked delay, and natural, plate, or non-linear reverb choices). Time to take to the stage or studio today, then, and get grooving with Stroke Machine in the most illuminating ways possible. Never has your iPad looked or sounded so good!